RoseHosting is a long-standing, extremely experienced VPS Hosting company based in St. Louis, Missouri, USA. Founded back in 2001 by Bobi Ruzinov (CEO), they were the first web hosting company in the world to offer commercial Linux virtual servers. You would be hard pushed to find many hosting companies that have the legacy of RoseHosting. The company was created with the vision of being the leading provider of user-friendly, reliable, fully managed Linux VPS hosting services worldwide. Almost 2 decades on, and they are living out their mission. They offer multiple Linux VPS plans tailored to suit even the most demanding requirements. With some great WordPress optimized services. RoseHosting specializes in providing VPS (Virtual Private Servers) with the best performance, flexibility, uptime, and security. Although they focus primarily on VPS hosting, they also now provide both shared and dedicated hosting. All of the web hosting is done on SSD servers; therefore you will experience sites on their servers delivering high speed, top class performance. Jeff over at RoseHosting kindly took the time to set us up with our own VPS for the purpose of this review. We managed to set up a WordPress blog and install a theme on their server within minutes, with their easy to use system. We found the hosting quick, seamless and trouble-free. In addition to this Jeff has been an amazing help. We got a relatively inexperienced member of our team to take part in testing the hosting, to see just how easy it would be. And, we are delighted to say that it was super straightforward to quickly set up a WordPress site and get up and running in minutes. The team over at RoseHosting have been extremely supportive and helpful. No latency or lag times when viewing content online is super important. Especially with more and more people coming online and expecting everything instantly. When a website takes too long to load often people will drop off, therefore this part of their hosting service is a huge boost, and definitely a reason to choose RoseHosting. Have you ever lost a website, document or even just an email that you had written? I know I have, and it is super frustrating. RoseHosting has got this covered with their “Weekly Backup” Service. The average response time is just 5 minutes. Certainly, a fantastic reason to choose RoseHosting, when you think of how much support is often needed when setting up a new server. On reading their customer reviews, that is often the key selling point. With so many happy customers, any affiliate should jump at the chance of advertising RoseHosting on their emails and website. It is hard to mention many cons when it comes to RoseHosting as they are truly an exceptional web hosting company. However, it would be fair to say that they are not for those on a budget. With control panels not coming as standard on some packages and the fact that all of the servers are of such a high quality, it is no surprise that these guys are not the cheapest web host around. However, their superior service and knowledge will probably justify the cost for most people. Sure, this may sound like a selling point at first, and it is! However, it may take customers longer than 7 days to make their way around their new server and by that time the guarantee might have expired. So not for the dim-witted, you have to be quick off the mark when it comes to the money back guarantee. RoseHosting offers a true, no-quibble 7-day money back guarantee to new customers and has some impressive 100% 5-Star Reviews from their customers from various independent websites. We are super impressed with RoseHosting and their cutting-edge products and services. An amazing company to choose for people looking for optimized, lightning fast websites. 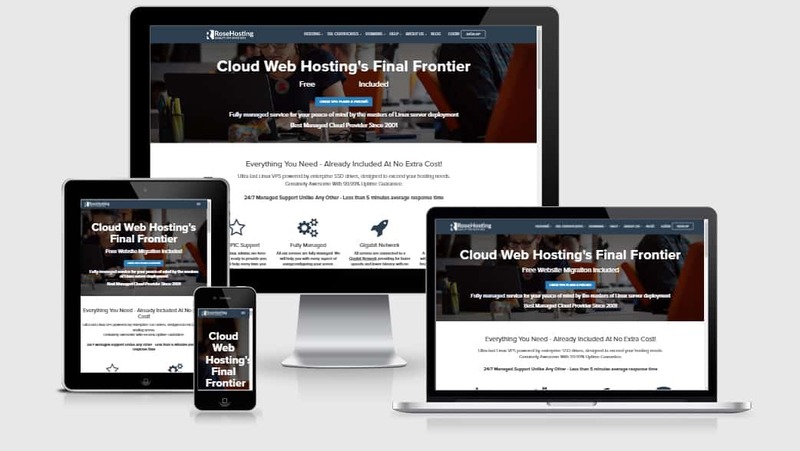 We would like to thank Jeff over at RoseHosting, who kindly set us up a demo VPS, fully installed with WordPress, so that we could have a good look around and see what they have on offer.